I have made these and they were a hit!! 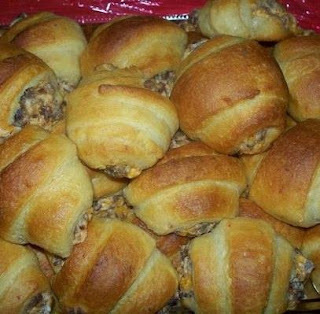 These look and sound like the perfect meal for breakfast...So to prepare this recipe you need first to combine sausage & cream cheese together and shredded cheese if you'd like. Then you need to separate rolls into triangles. Second step : At this step all what you need to do is to cut eat triangle in 1/2 lengthwise. Then you need to scoop a heaping tablespoon onto each roll&roll up.